If you win the lotto for $50 million and someone owes you $50, do you let the $50 go? Listen you owing me money has nothing to do with a DEBT that YOU OWE! You out your damn mind if you think you don’t have to pay me back. 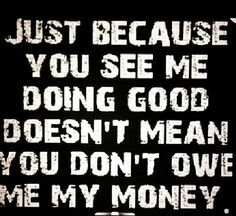 What is in my bank account 1) is NOT your business 2) doesn’t change wanting back whats mine. 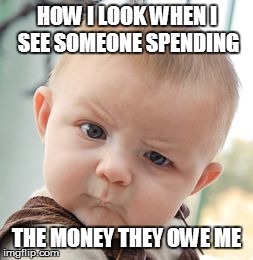 Yes, you still need to give back what you borrowed and gave a word to pay back. Without it, you’re a liar, probably labeled as a thief and no one really will want to deal with you. Now, while you’re making a fuss again about them having the money and not needing it… You don’t know what that person needs and it’s not your business to make that decision for them. Point is YOU. OWE. ME. In the words of Kash Doll “run me my money”!